I understand completely how Smith felt. 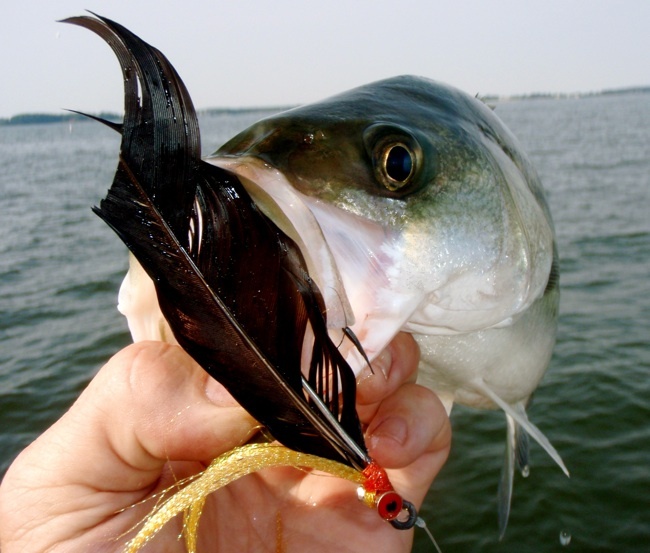 Bluefish and small striped bass are very plentiful around Kent Island in mid-summer. Things have changed dramatically since the 1600s when Smith was here, but in August there are still areas teeming with thousands of hungry fish. Catching them is rarely a problem. To keep things interesting, fishermen have to either target species other than rock and blues, or come up with entertaining techniques like in my previous report about the Old No. 7 “pop & drop” miniature. Since the gauntlet had been thrown with the buzzard feather, I felt like I had no choice but to accept the challenge. This morning after coffee, I grabbed a white coat hanger out of the downstairs closest and headed out back to my workshop. The first step was to modify the hanger into a hook. 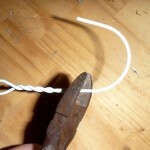 I cut the wire and gave it a bit more curve by bending it around a hammer handle. Then I put a steep loop on one side to serve as the hook eye. I put the other end against the grinder wheel and made it nice and sharp, then ground on it a little more to remove the paint. As the hook took shape I started wondering if I couldn’t make all my hooks. It turned out to be surprisingly sturdy, approximately 3/0 in size. Since I’m not keeping many fish anyway, there is no reason to add a barb. 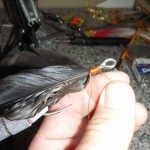 Next I set my homemade “hook” in my fly vice and trimmed the buzzard feather a little to match the size, tying it on with some orange thread. Since my challenger didn’t provide any rules or restrictions, I decided to dress it up a little with some orange flashibou and stainless steel barrel eyes. 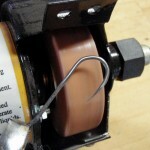 The last step was to coat the thread with some flexible head cement, and I was ready to fish. I spent the rest of the day with chores and honey-dos all the while mentally planning my upcoming evening fishing trip with my new lure. To be honest, I thought catching fish with my buzzard feather clouser fly would be a piece of cake. With good current and an impending cold front, the fish were sure to be on. Breaking fish will attack almost anything. A rockfish blitz can make even the most inexperienced fisherman feel like a seasoned pro. Sure enough, after launching about 6:00 PM, I found working birds over breaking fish within a few miles of the Shipping Creek boat ramp. To say the fish were “on” is really an understatement: they were on fire! Twenty one to twenty five-inch stripers were practically jumping into the boat. One fish even knocked a 4 inch alewife out of the water and on to the swim platform of Crockett’s Reel. I tied the fly on to my 7 wt flyrod, made one false cast, and then flung the sinking line out as far as I could toward the breakers. I was surprised at aerodynamics of the feather. Even though there was a 12 knot breeze, it cut through the air like the fletching on an arrow and landed exactly where I’d hoped it would. I stripped line into the swift current and waited for the strike. It never came. I pulled in my line and loaded up my rod for another surprisingly beautiful cast. I’m not great with a fly rod. If I can get my lure 30 feet away from the boat, I consider the cast successful. But this haul was even better than the first, right into the middle of the rockfish blitz. There was simply no way they could ignore it this time. I untied the fly from the flourocarbon tippet on my flyrod, and picked up the baitcasting outfit I use for jigging. 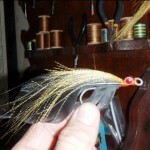 I was just about to drop my soft plastic Zulu over the side of the boat when the thought occurred to me – dropper fly. I hastily fashioned a loop about a foot above my lure by tying a triple overhand loop knot in my 30 pound leader, and tied it to the coat hanger hook. I threw slightly upstream into the current and let my rig sink all the way to the 35 foot sandy bottom. A couple of swift pops up and BANG: fish-on. Maybe it wasn’t a very smart fish, or maybe the black feather wasn’t so visible in the deeper water, but for whatever reason, a 19-inch striper had taken the buzzard bait. I managed to keep the line tight enough to get the fish into the boat and take a quick picture before releasing it over the side. Excited about the satisfied challenge, and noticing that the school had moved away from the boat, I made an over-zealous cast into the stiff breeze. 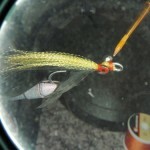 The heavier jig completely negated the aerodynamics of the feather. It fluttered and tumbled in the wind, my reel backlashed, and SNAP: my new lure was gone. I can’t say I’ll miss it though. Why in the world would anyone want to catch a fish on a coat hanger and a buzzard feather anyway? Next time maybe I’ll just say, “there were so many fish I could’ve caught them with a frying pan.” On second thought, maybe I’ll just keep quiet! Shawn: What an enjoyable story to read with this morning’s coffee. I’m sure you would have landed a striper on your Buzzard Feather & Coat Hanger Fly, on a fly rod, if you’d only stuck with it. The only way to do this is to leave the light tackle home and take out fly equipment only. 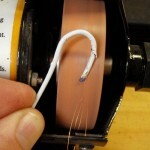 This is from anglers who knows! This is the most humorous and entertaining fishing story I have read in a long time. It is deserving of publication for a larger audience. Now the next logical step; how would a Jack Daniels bottle tied with a Buzzard Feather and Coat-Hanger Fly work? If anyone could do it, I had no doubt you could! WTG! Funny article. Good work. Now that there is clever! I enjoyed your story Shawn. I have printed out a copy for my father. He was always rigging , or fixing, something with a coat hanger. He will appreciate your ingenuity. Very entertaining and superb writing. Reminded me of an event that took place years ago with my youngest son. But thats another story. Thanks for posting. A great article, as is the standard of all of your reports. It’s past time for you to start writing for the major national publications! THANK YOU… I really enjoyed this article as I do most of what you write. Keep up the good work. Let’s reflect on the “Buzzard Feather” episode for a moment. I don’t believe you met the intent of the initial challenge. By using a baitcasting rod and by employing the fly as a “dropper”, you failed to fulfill the intent of your boastful claim. 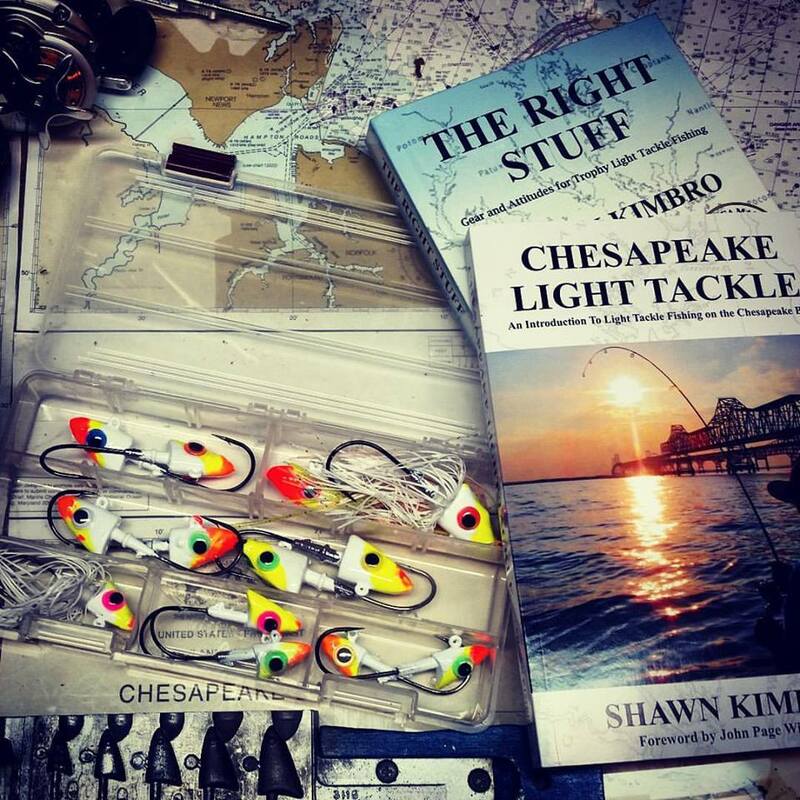 I will donate a $100(US) to the charity of your choice if you can catch a Striped Bass over 30″ using a single Buzzard fly (same type feather and coat hanger) on a fly rod. You have until 01 Jan 2010 to complete this challenge. Since there’s no reciprocal obligation, I’ll take the bet, but I think you’re safe. On the other hand, there’s a possibility at the CBBT in December! I have seen this bro. operate. M d’F, you might want to start saving. I have got faith in him!!! The problem might be finding a charity that will except buzzard meat though. Don’t loose any sleep over it Shawn! Lets not forget our mission at Percy Priest….flotsam and jetsam, grasshoppers and……machismo…. Great fun. We found ourselves at the outflow of the dam with two hours to kill and no fishing equipment. We looked around a little, found a hook, some sinkers, line tangled in a bush, and before long we had all we needed for two fishing outfits. I learned one thing, when it comes to catching grasshoppers my son is a hell of a bass player. Gotta hand it to him though, once I caught the bait for him he finally hooked a fish!